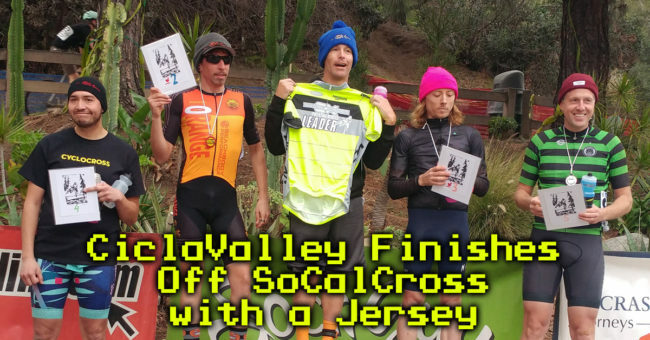 CiclaValley did some winning this past weekend, but more importantly, I came to better terms why I love SoCalCross so much. This past Sunday, I had one of those rare open eight hour blocks on my schedule where I could do whatever I wanted. Normally, I would fill that with an epic 60 – 90 mile ride somewhere in the mountains, but this wasn’t a typical weekend. 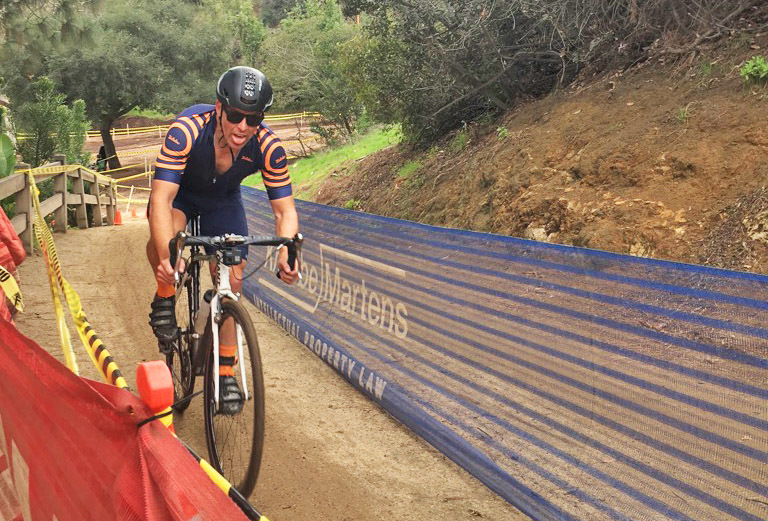 SoCalCross was coming to one of my favorite venues, the Greek Theater on Sunday for its season finale no less. The main reason for wanting to go wasn’t exactly the racing which I have a love / hate relationship with. Every time I mentioned ‘cross was coming to Griffith Park, I seemed to gain another friend who wanted to come if they hadn’t already committed. My co-worker Kevin was super jacked to come even though his oversized bike with his 3″ tires would obviously be a detriment compared to what other cyclists were riding. What the heck though? That’s the beauty of the sport. I showed up with the intention of racing C’s in the morning and possibly the afternoon race as well depending on how my recently flared up arthritic hip would hold. Also, planted in my mind was the possibility of winning the season series in the category although my knowledge of the point system was as cloudy as that city Lando Calrissian is from. Lining up at the start, I was given the first placement due to having the most points within this group of racers which was a bit surprising. Off the bat, I had my typical slow start even though this would be my most dominant section on the laps to come. The big challenge of the day was the effect the heavy rains from the day before would have. Already, the number of tight turns didn’t help, but the muddiness exposed by my lack of technicality even further. Getting a practice lap in didn’t quite prepare me for racing speed and on the first lap, I somehow clipped out and kept momentum going as I started to slip out around a turn. That was a good lesson early to try to maintain my poise and use a bit more caution on the course as already I had seen a couple of wipeouts in our race. With all the twists and turns, progress would only be incremental for me, but I was slowly chipping my way towards the front. Once again, I knew that if there was a section for me to gain time, it would be the straightish climb through the starting line. 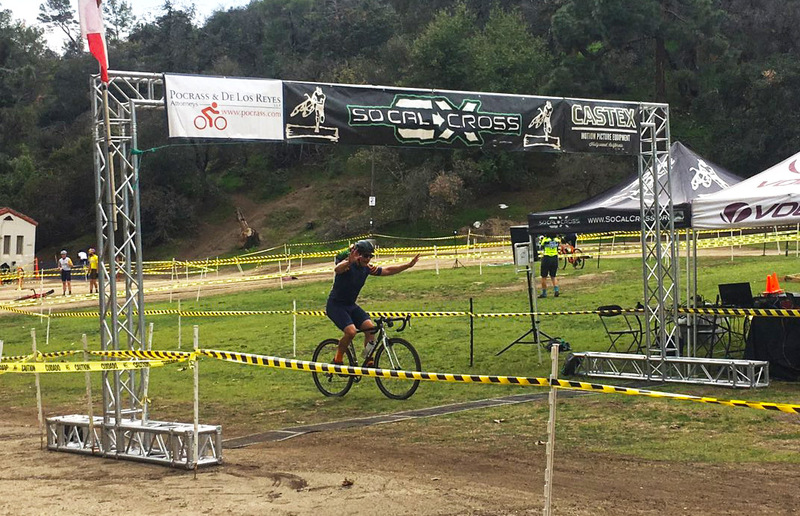 Whoops, that was my double pass at the Sylmar race in December. Here’s the pass I meant to post. Within the first couple of laps, I made my way into second place, but I knew I had my work laid out for me. The slow start and the time taken up getting around riders left me with a fifteen second gap to the front. I kept riding at my own pace and after a lap I gained time, but only a couple of seconds. Same thing on the next lap, but since this race was only a half hour, I knew time was running out. Near the 22 minute mark, I heard the bell ring as I completed the lap meaning I had to gun it a bit if I had a chance of catching. I wasn’t in a big rush getting back on thinking it would probably take two unlikely crashes up front for any chance to win this thing. For the remainder of the lap, I did just enough to keep the third place rider behind be while trying not to wipe out a second time. Near the end of the race, I lapped Kevin who I think had a great race considering the big bike he was hauling. Second place wasn’t bad, but while it was tempting to win the afternoon race, my body was telling me otherwise. The source of my arthritic pain didn’t seem so bad, but the rest of me felt pained compensating for this injury. Relaxing with the rest of Team LACBC and the BTS crew would have been a great way to spend the day, but there’s always that competitor in you. While lounging around, messaging that area of my back improved its condition, so much so that it felt like riding might not damage it more. My plan was to line up and if I was announced first, then I’d race hoping that I could earn enough points to take the jersey even though I had no idea if winning would be enough. Sure enough, guess who’s name was called first and I was determined to have my best start off the line for the season. Then go happened and right off the bat I found myself in dead last. I made a couple early passes, but I had to worry about fatigue from racing earlier even though it was a shorter race. Before this race, I only took a quarter of a practice lap which didn’t give me a great sense of how the course looked. As the laps progressed, I realized the course was faster as the muddy corners were now tighter and more compressed. Once again, I would slowly pick my way through the field in the same manner I’d always advance: waiting for that straightaway. While it would have been nice to pass here, I knew if I waited another few minutes until we reached my favorite spot that I could move ahead and create space. It was evident I wasn’t going to pass on the next few curves, but because of this blockage, I was worried that the rider behind might catch us the leader bided his time. I’m terrible at remounting, but I noticed the difficulty everyone had of gaining speed after the second set of barricades on the uphill proceeding it. Eager to not tighten the race, I tried passing again. While it was not to be, at least it put the pressure to not lose more time to the rider behind. You never know when those seconds are going to matter. From that point, I tried balancing firm efforts while gingerly navigating turns as not to take myself out of the race. Sure enough, the third place rider moved into second and I focused on keeping a good enough distance for the remainder of the race. As the laps winded down, so did the urgency to push it as I glided across the finish line. Not a lot of drama at the finish. More than the winning, you realize it’s the environment that what uplifts the most. Everyone shares the same adrenaline to compete and respects the effort each of us put forth. At the same time, the spectators on hand fuel the spirit as they are as much a part of the race as the riders with their enthusiasm and the occasional heckling. Winning the race was one thing, but taking home the series jersey felt a bit more distant because I would have done it all again even if I finished last. 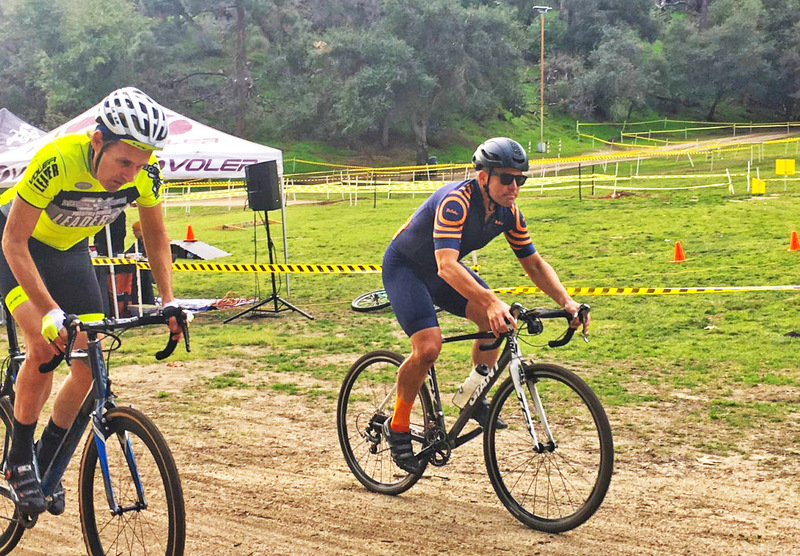 Cycling is about community and that atmosphere is always on display at SoCalCross.